With growing sensitivities toward recycling and organic gardening, bug hotels are growing in popularity. Healthy gardens need beneficial insects to pollinate plants and eat undesirable insects. Bug hotels, also referred to as insect hotels, provide shelter for bugs to hibernate, seek shelter in inclement weather and nest safely and are ideal for gardeners who would like to eliminate pesticide use. 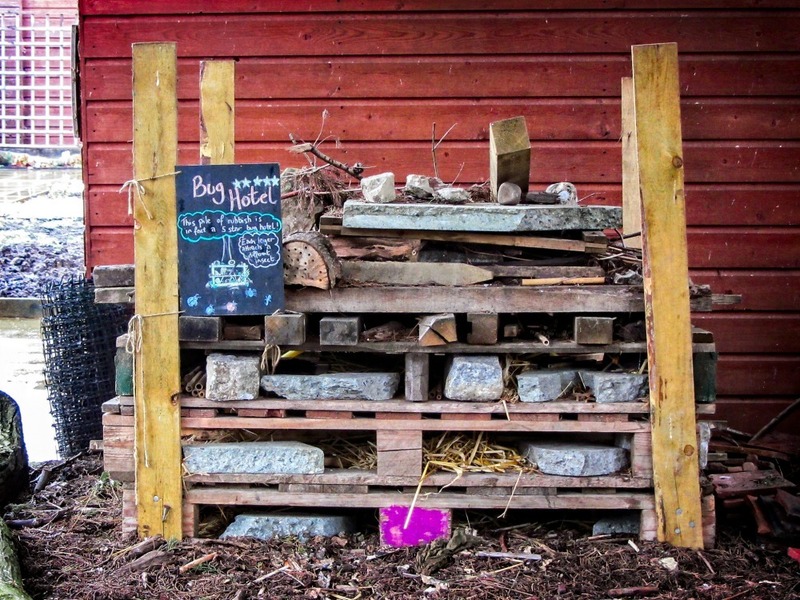 Building a bug hotel is easy and can be done with repurposed wood, garden scrap and other materials you may already have. Different bugs prefer different furnishings, if you will, and you can even create a contemporary-looking bug hotels that also function as garden art. This is a fantastic activity for kids to help with, too. Your bug hotel should be near where you need it most, such as alongside your vegetable garden. However, it does need to be sheltered from wind and extreme heat. Its roof will help protect the bugs from rain. Placing it in a spot where bugs already congregate is a sure way to get it fully-booked quickly. However, there is no harm in using the, “If you build it, they will come,” strategy provided a temperate location is chosen. Hang it on a wall, stack it on your paver patio, place it on a bare patch of dirt… it doesn’t matter. Just be mindful of proximity to high traffic areas if you’re looking to attract native bees (they usually only sting when provoked, however). Native bees and bumble bees both make excellent guests in your bug hotel. Most of California’s 1000 species of bees are native bees who are solitary and don’t nest in hives with drones. Rather, they usually nest in the ground in holes they’ve dug themselves or already existing ones. Solitary bees pollinate plants during their nesting process as they gather pollen as a food source to store near where they lay eggs. Twenty-six species of bumblebees are also native bees and happen to be excellent pollinators for tomatoes and other vegetables. Some gardeners have success attracting bumblebees to bug hotels, while others find it troublesome. Drill holes varying in diameter into sawed-off logs in an attempt to accommodate varying bee sizes. Different bees have different requirements. The common mason bee needs about 1/2″ diameter and a 6″ deep hole to build its nest cells, for example. Hollow plant stems like bamboo canes stacked on top of each other also make excellent nesting spaces for bees. When the bee is done building a nest, she’ll plug the hole with mud, pollen or even leaves until its time for offspring to emerge. Bees do need some warmth, which shouldn’t be a problem in Southern California, which is part of the reason why some homeowners insulate bamboo canes inside of round terracotta piping. Adult ladybugs hibernate during the winter, preferring shelter from dry leaves and sticks. They eat pests such as aphids which are all too common in California gardens. These pretty green aphid-eaters take up residence in rolled up cardboard. To protect the cardboard from moisture, insert it into a sawed-off soda bottle. Add some straw or leaves for additional shelter. Though they’re not bugs, spiders will find space in or in between hotel furnishings meant for other insects. We do love garden spiders as they are voracious predators of garden pests. They don’t discriminate and, yes, lovely butterflies wind up in their webs at times, but they are a necessary part of the garden. Find some rotting wood or loose bark for these creepy crawlers to hang out under. Beetles, woodlice and millipedes are essential soil helpers as they digest rotting wood and garden waste while centipedes feast on slugs. You can’t control who checks in to the bug hotel and it is inevitable that some unruly tenants will find it a hospitable place to hang out (earwigs, we’re looking at you). Take a deep breath and hope that the good bugs outweigh the bad ones (they usually do). The design of your bug hotel can be as simple or as sophisticated as you like while blending into your existing garden design (or not). Create a shadow box by basically sawing up and nailing together a 2×4 (or larger) piece of wood into a square or rectangular frame. If the frame is large, compartmentalize it into geometrical sections and dedicate each section to a particular bug. Fill a section with sticks, the other with bamboo canes, another with pine cones… you get the picture. A nice contemporary look to jazz up a fence is to hang several small shadow boxes with one bug material in each. 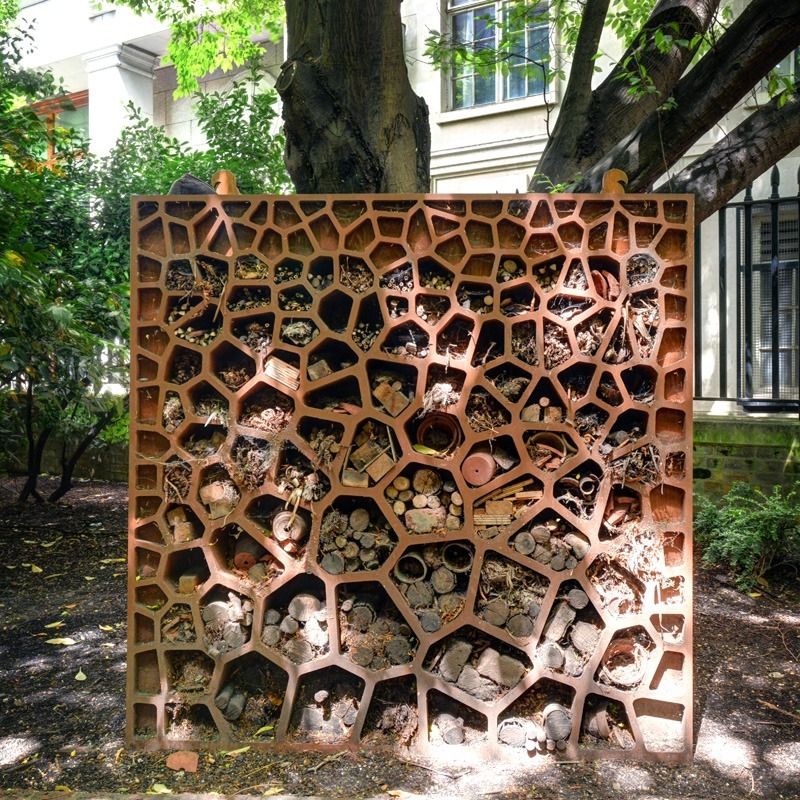 Sunset magazine has excellent examples of stylish bug hotels. Keeping the roof, floor and two of the four walls in tact, by removing the other two walls (usually the front and back) and filling the now empty space with bamboo canes is a popular bug hotel design also because it can be hung. 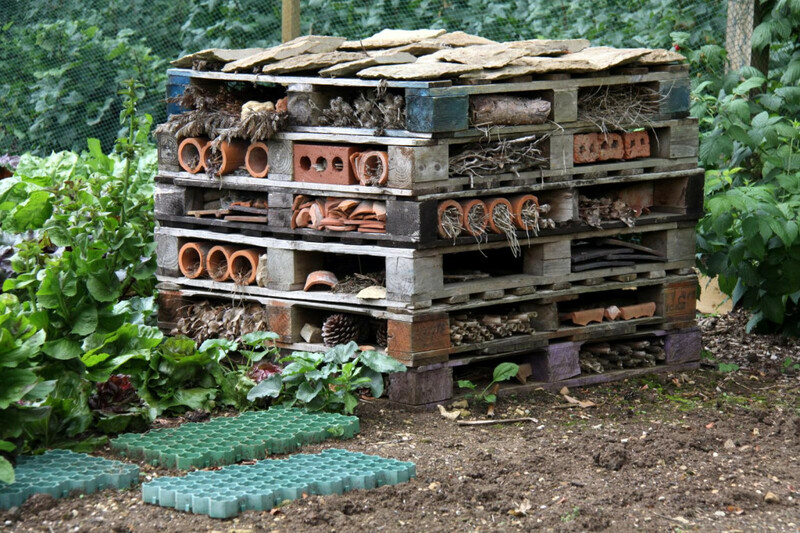 The most common bug hotels built by those who have the space is by using blocks in between stacked pallets. 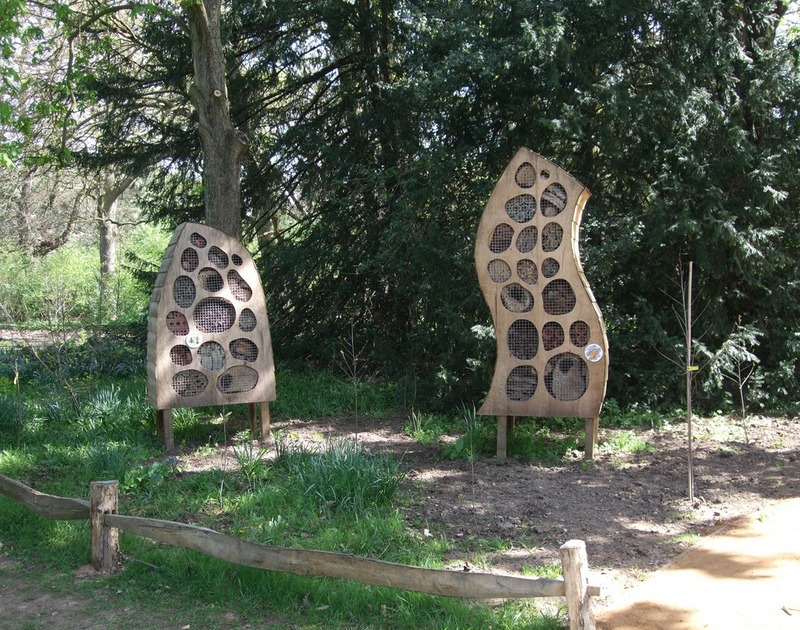 Each side of the bug hotel is stuffed with material that can potentially house creatures. There are no rules when it comes to bug hotels. This homeowner cleverly incorporated a bug habitat directly into a stacked stone wall. If you have left over grass pavers that have holes in the middle for grass to grow, these provide perfect shells for bug houses. Covering your bug hotel with chicken wire or other screening (that still allows bugs to pass in and out) will protect it from birds and other wildlife (or even curious kids). While the bugs can’t read your welcome sign nor do they care what the name of the hotel is, kids may get a kick out of creating one. It also will let curious guests know exactly what your beneficial garden structure is. Do you have a bug hotel? If so, who are your guests?